A 20 mm conduit has O.D. 20 mm. A 25 mm conduit has O.D. 25 mm. A 32 mm conduit has O.D. 32 mm. A 40 mm conduit has O.D. 40 mm. A 50 mm conduit has O.D. 50 mm. A 63 mm conduit has O.D. 63 mm. 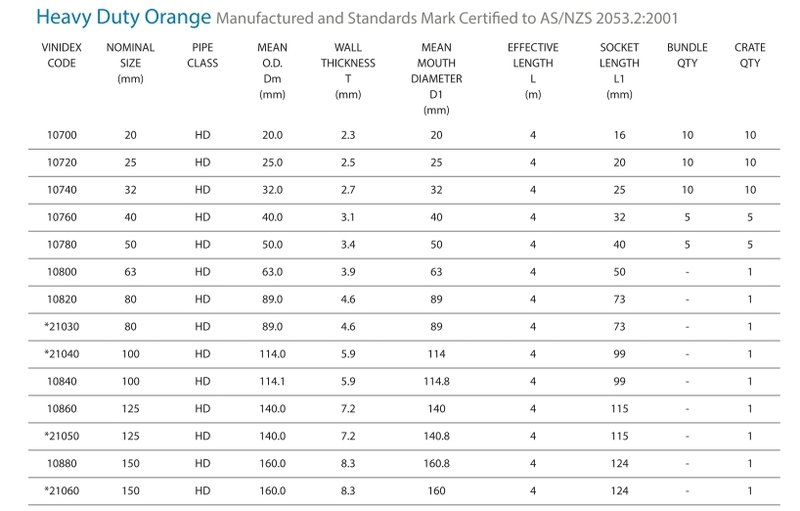 Question: What is the outer diameter of a 150 mm HD orange PVC electrical conduit? Nope. Given O.D. of 160mm and wall thickness of 8.3mm, the inner diameter of a 150mm HDPVC conduit is 143.4 mm. So there is no dimension of a 150mm conduit that actually measures 150mm. Conduits less than 80mm are specified by outer diameter. When pulling cables through a conduit, you care about inner diameter. You need to look this up from the catalogue. If you do your calculations based on the outer diameter, your cables won’t fit in the conduit. Conduits 80mm and above are specified by… well, who knows? The conduit nominal size bears passing resemblance to the inner diameter, but again, you need to look up the inner diameter from the catalogue. Which is to say that unlike small electrical conduit, where the nominal dimension does mean something, there is no dimension of a BSP ½-inch pipe - light, medium, or heavy-duty versions - which actually measures half an inch.